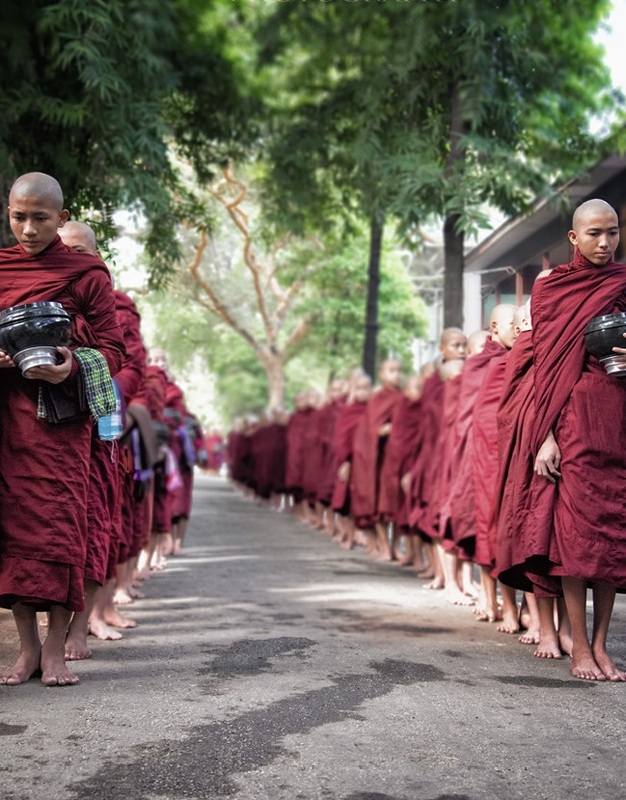 Myanmar now is at the top 10 places to go in 2015, where is like Southeast Asia’s last frontier, where almost everything still feels undiscovered and off the beaten path after decades of military rule. 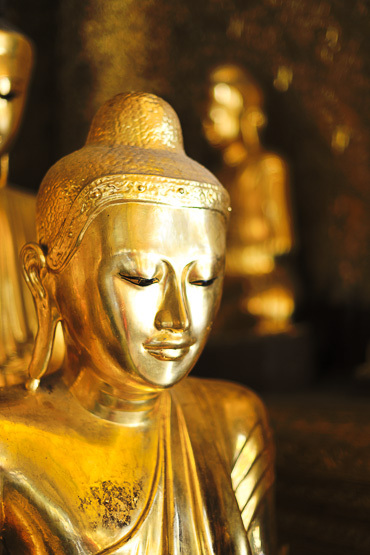 The Golden Land is a country rich in culture, history, sacred sights, and scenic wonders. 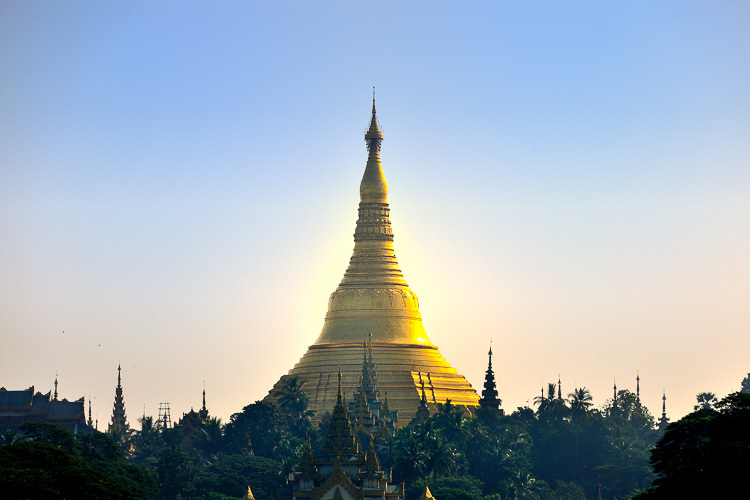 The most famous pagoda in Myanmar is Shwedagon, which overlooks the capital, Yangon. 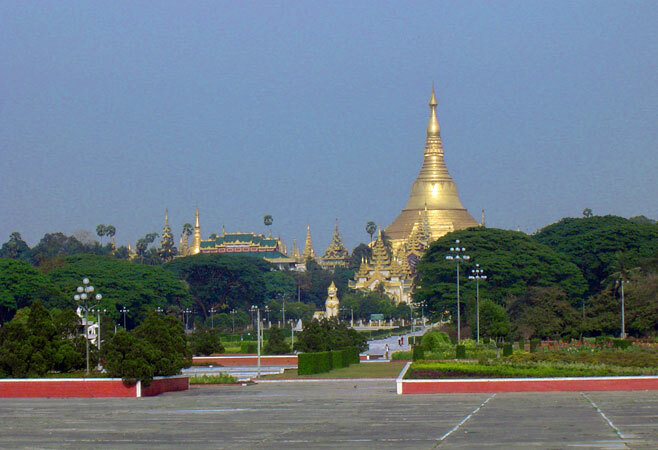 Yangon is the cosmopolitan and the main business city of Myanmar, also known as “The green city of the East”. 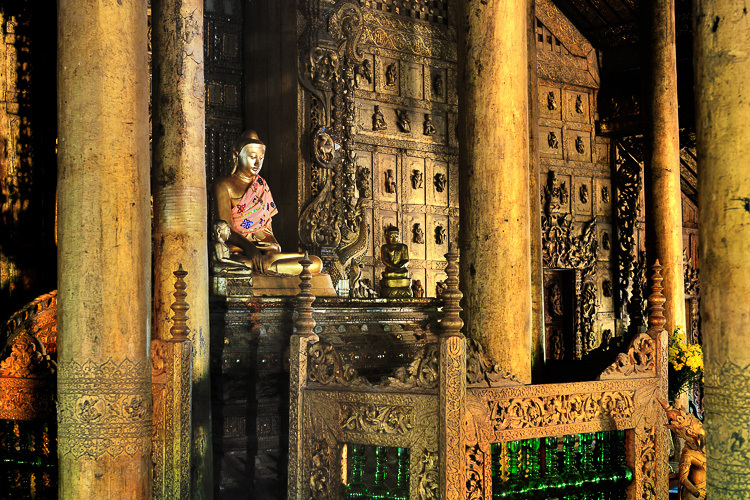 Myanmar lures visitors with its nature beauty and its dazzling pagodas! 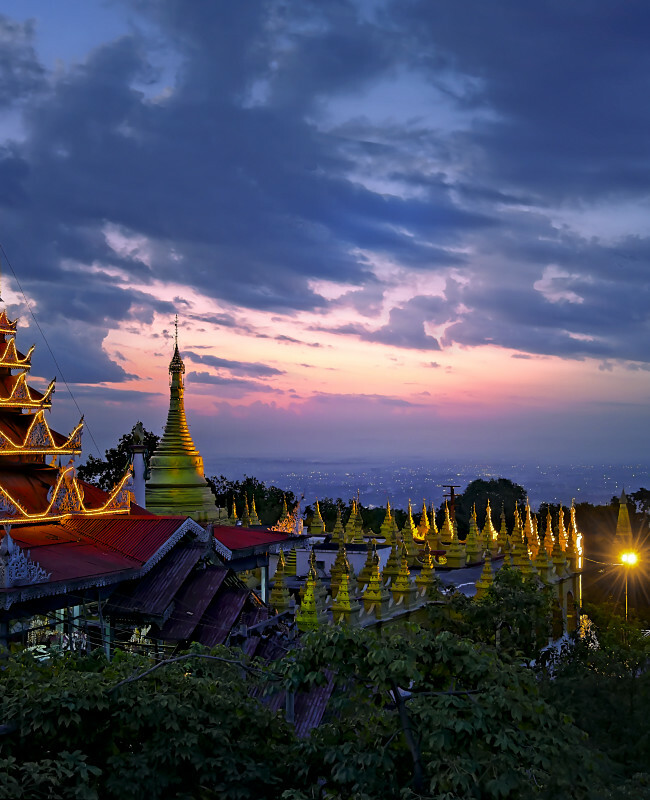 Sitting high atop the sacred shrine of Singutara Hill, this pagoda houses relies of the Budha encased in shrines covered with gold and jewels. This wondrous holy place should not be missed. 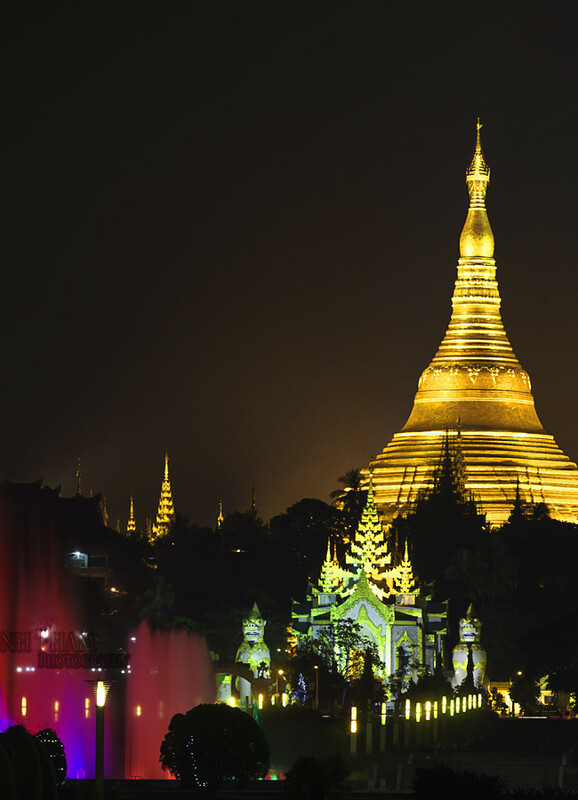 Other places of interest are Sule pagoda “The heart of city”, Bogyoke Aung San market, National museum, and China town. Mandalay is next destination. The second largest city and the last capital of the last Myanmar Kingdom. 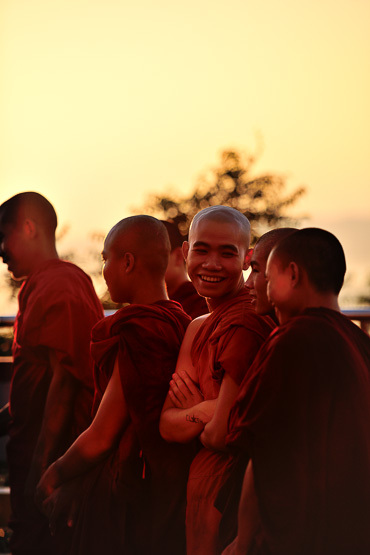 The city remains many monasteries and pagoda with conservative tradition and the lifestyle of its own culture. There are many tourists come to this place, however it is worth visiting because that is a reason you will visit Mandalay? 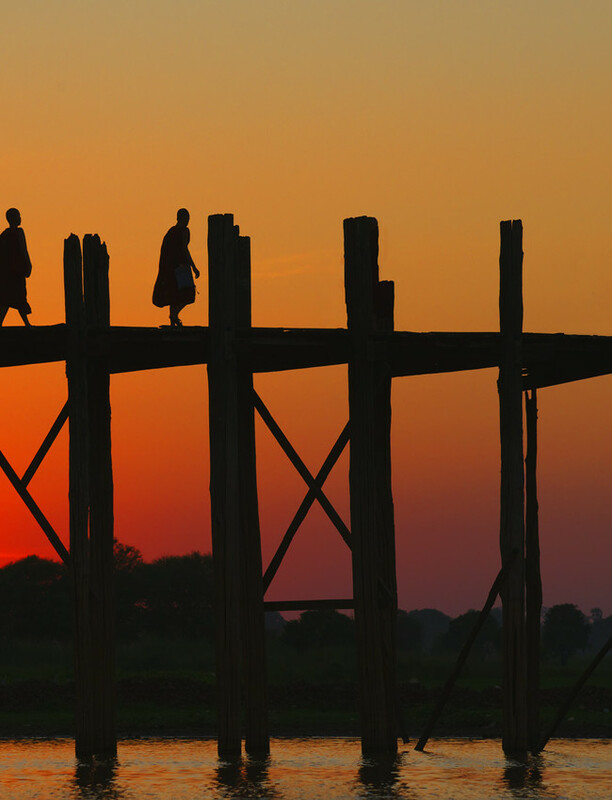 The U Bein Bridge is a 1.2km long teak bridge, which is certainly the highlight of AMarapura. In the dry season, the bridge crosses mostly dry land. The best time to visit is at sunset. Tet is coming soon and all of Vietnamese people are counting each day till the biggest day. Tet Nguyen Dan, or Tet for short, is always the biggest and most popular festival of the year in Vietnam. Celebrated on the first day of the first month in Lunar Calendar, Tet’s celebration is the longest holiday which may last up to seven days or even more, depend on each year. This year, 2015, Tet is on Febuary 19th but the actual holiday will last 1 to 2 days before and about 3-5 days after the day I mentioned. Why is Tet changing each year? It’s all because Tet is calculated on Lunar Calendar. Different from the Gregorian calendar, Lunar Calendar has a fix number of twelve months with 30 days each, and a leap-year will have a whole intercalary month instead of the 29th day of February. The new year of Lunar Calendar normally will start in late January or beginning of February according to Gregorian calendar. That explains why Tet days vary from year to year: it is because the leap month may fall shorter or longer which create a smaller or bigger gap between the two calendars. As a traveller, you might not need to get all the Vietnamese’s excitement and emotions, though there are certain things that you probably should know about. 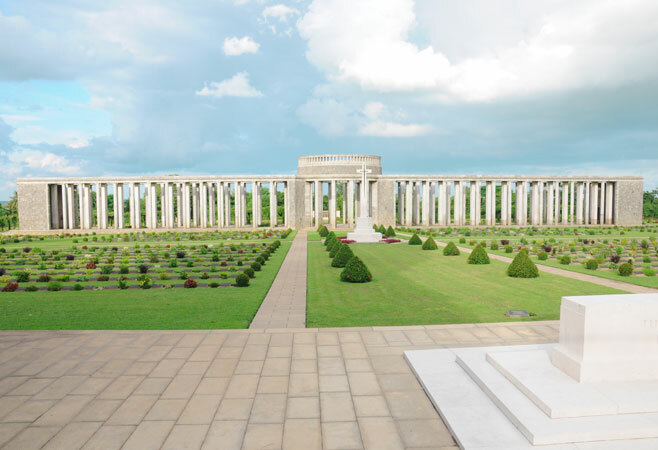 At least you should have an idea whether your upcoming holiday in Vietnam will coincide with this grandest event of the year. This time, not like your imagination about most of festival in Vietnam, Tet is like Thanksgiving Holiday, when Vietnamese come back to their hometown, meet their family and spend most of time with their relatives. During 3 main days in Tet, you will see a totally different of Vietnam, less of people, traffics and completely peaceful and quiet. Travelling in this time could be difficult for foreigners when most of stores are closing while the price of transportation is rocketing and even not available. But, it’s worth to give it a try to join Tet in Vietnam, especially in Hanoi. There are a lot of unique thing you can only do in this special time, but in here, the favorite part I would like to introduce to you is some Traditional Tet’s foods of Vietnam which every family will cook in this time. Moreover, all of those dishes are so delicious. 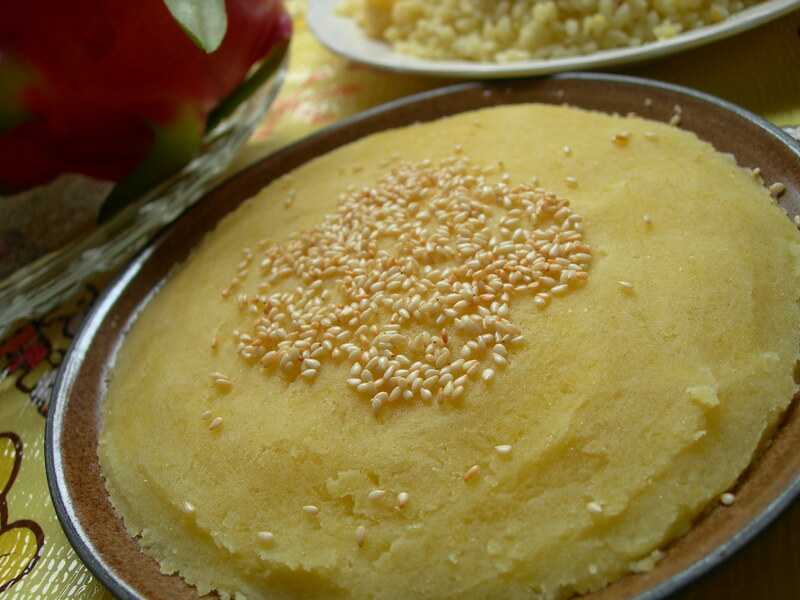 Banh Chung (steamed square cake) and its Southern variety called Banh Tet – is unique to Vietnam’s Tet holiday, though many other countries (China, Japan, Korean, Singapore, Taiwan) celebrate this holiday as well. Banh Chung is a food made from glutinous rice, mung bean and pork, added with many other ingredients. 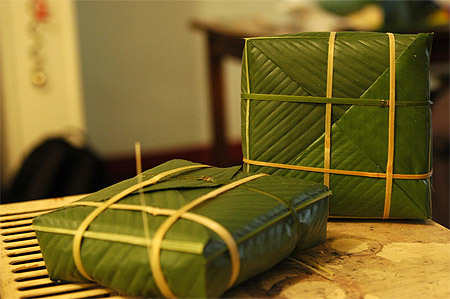 Banh Chung is covered by green leaves (usually banana leaves) and symbolizes the Earth, invented by the prince Lang Lieu from Hung King dynasty. Especially, in some villages, the true “Banh Chung” will be boiled in rain water.. Besides traditional reason, Banh Chung is chosen as the main food for Tet holiday because of it can last long for days in the severe weather of Vietnam. Banh Chung can survive at room temperature for nearly 1 month! In Vietnamese culture, Tet will be the biggest feast of the year with a lot of foods and the main dish will be meat. However, eating too much meat often makes people feel sick and that is the right time for something sour, fresh and low-calorie to play the role of balancing – and Vietnamese pickled onions come as the ideal solution. 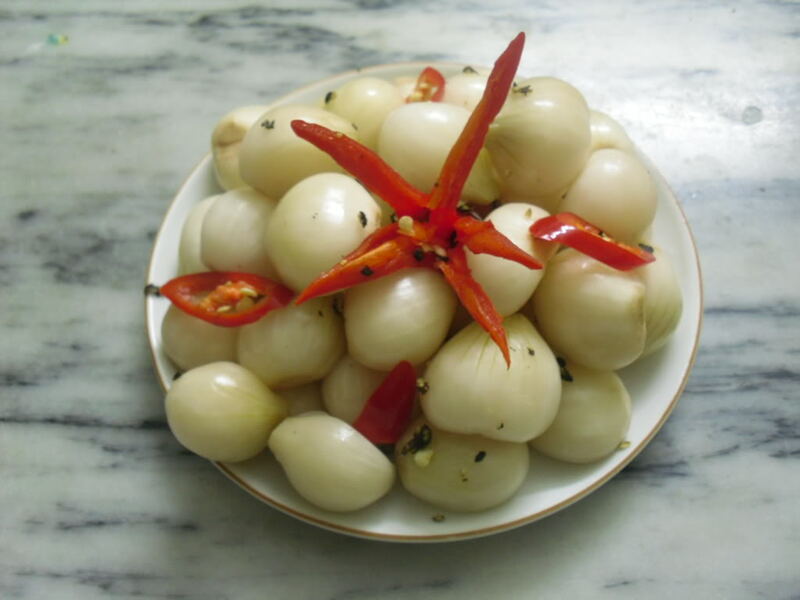 And for many Vietnamese generations, pickled onions have been a cannot-be-missed dish during Tet holiday. As much as a meat taste-countering ingredient, Vietnamese pickled onions also serve as a natural medicine for better digestion after high protein meals. The typical aromatic, crispy and sour taste of pickled onions going with fat jellied meat and tasty sticky rice cake awakens the Tet atmosphere in every family dinner. This dish is usually served with Banh Chung and they seem to be born to each other. This dish is quite strange to taste but it’s delicious and good for your health. To old Hanoian generations, mung bean pudding has become a familiar dish which always presents on the ancestors’ altar at New Year’s Eve. Mung bean pudding is not a delicacy but a dessert, its ingredients contain a precious medicine for gastrointestinal diseases – the cardamom. Cardamom is a highly aromatic spice that is most commonly planted in mountainous provinces of Vietnam, its flavor is slightly sweet and hot, very suitable to combine with a wide range of other ingredients from poultry, vegetable to cake. And in the dish of mung bean pudding, the hot cardamom goes perfectly with the cool mung bean. Unfortunately, this dish has lost its position in Vietnamese Tet’s meal, people can only see this dish at markets and pagodas or in some traditional village near Hanoi like Bat Trang – Ceramic Village. Mung bean pudding is made from dried mung bean, sugar, grapefruit extract and cardamom following a secret portion that only skillful and experienced cookers know and that is the reason why ancient mothers always took this dish to test the ingenuity of their future daughter. We hardly see this dish around but if you have a chance, don’t hesitate to try it. Very light and a perfect couple with Banh Chưng. “Ga Luoc” (boiled or steamed chicken) plays an important role in Tet holiday cuisine because all the tribute meals to the ancestors must contain a WHOLE boiled chicken. 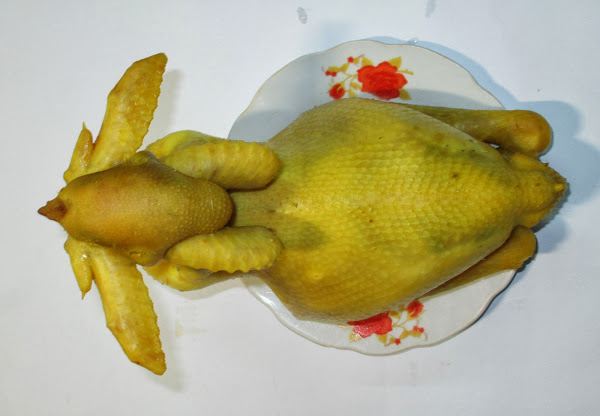 Chicken meat in Tet meals are various in forms: usually chicken are boiled and sliced, but in the most common way, people will place the whole chicken in a plate and the chicken may hold a rose in its beak. Chicken meat is served with Xoi (sticky rice) and Banh Chung, and become one of the most popular main dishes in Tet holidays. Boiled chicken are always go with sliced lemon leaves and salt-and-pepper sauce, as a tradition. Chicken (especially bones, legs and heads) can be used to prepare the broths for other soups. Why does Vietnamese choose to cook chicken in Tet will be an interesting story you can ask your guide when you come to Vietnam. To make a perfect boiled chicken is not an easy job. The most important part will be the decoration on dish. Mut Tet (Tet jam) is not a food to serve in a meal during Tet holiday, but more like a snack to welcome guests in this special period. Mut is always kept in beautiful boxes and placed at the table in the living room, and it is the main food for the owners and guests to taste when they’re talking, enjoyed over a cup of tea. Unlike Western jam, which is usually in liquid form and served with bread, “Vietnamese jam” is mainly in dry form, usually dried fruits and some kind of seeds (pumpkin seeds, sunflower seeds, watermelon seeds). This once-in-year mix of snack is very large in variety, with so many tastes: ginger, carrot, coconut, pineapple, pumpkin, lotus seed, star fruit, and sweet potato. 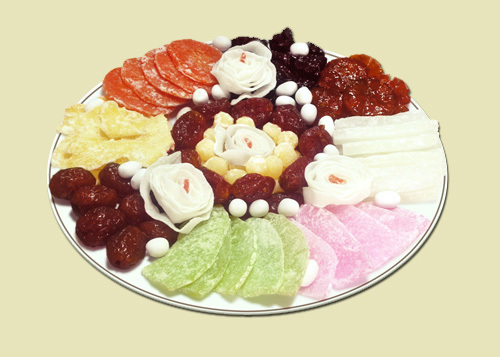 Nowadays, cake and sweet are slowly replacing jam in Tet period, but many people still love the taste this unique food – an angle of Vietnamese culture. You can easy find this in every Vietnamese family in Tet Holiday. These are popular but meaningful foods we have in our biggest holiday. Let’s try them if you are travelling in Vietnam during this holiday.